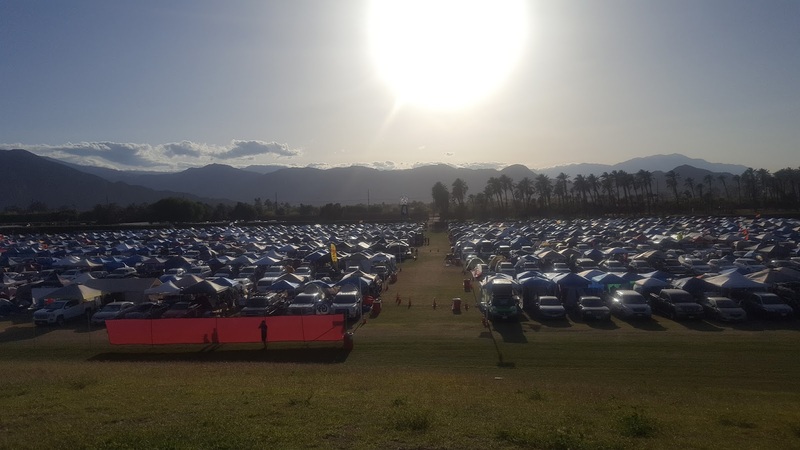 Coachella 2017 Weekend 1 - Welcome to Hell ... My Mistakes & How to survive and enjoy the camping. There's a few parts to the Coachella story so don't assume from the title this is all bad press. If anyone learns anything from this post it won't be time wasted. Having been to Coachella 2012 we decided to make a trip across the pond again in 2017. 3 of those were true, if you succeeded! 2 were not even relevant this year, not in the slightest! Having opted for a cheaper Car Hire company, we got a big car but not the dodge we paid for. With no option we had to take the only 4x4 available but any assumption of sleeping in it went out the window... it wasn't designed for that. Hell after Brexit and GBP exchange rate panning then cheap was the way to go. Mistake number 1. Not letting the car spoil the fun, we headed off for a 4day stay in San Francisco before making the drive cross the state to Indio. My review on SF & CA may come at some point, but not today. Cut ahead to the journey to Coachella, stopping off at Lompoc Walmart to buy the whole world of camping gear we needed (future mistake number 2). Downside to camping in another continent: You can't take your gear on the plane. Now we also needed a bigger and extra sleeping stuff as the car was off the cards: 8man tent, airbeds, chairs, pillows and sleeping bags. Somehow, smashed it. Including the full holidays worth of suitcases. 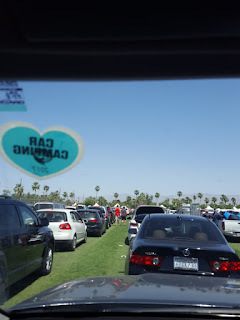 Fast forward to the following day, having stayed at Holiday Inn Indio we only needed to make a short drive to Coachella. We knew from past experiences of festivals set off EARLY. Knowing this we still anticipated a good few hours in the car queue, the wristband queue and the camping queues. We're fine with that, better camping spot = less walking. 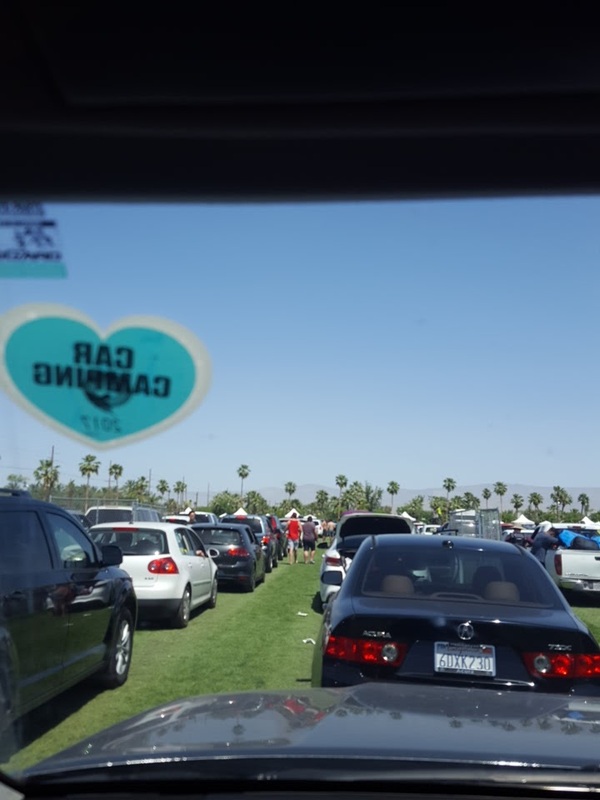 Needless to say Coachella didn't let us down, a very very long and hot wait around to get to the site and wristbands. A very hot wait, considerably hotter than 2012. Finally after a few hours we were driving to the spots, elation and ecstasy feeling real now. Coachella 2017!! I don't remember what colour campsite was best so I followed the cars and direction from the stewards assuming this would be closest to the entrance. Mistake 3. Red Path area 4, previously we stayed in 8 - if only I remembered then. Never the less as a massive music fan, despite line up being not entirely on point, I was still excited and ready to Coachella. Pulling the car into the spot, which felt smaller than before and maybe the car size didnt help. We squoze in and cracks a cold Cider open Mistake 4... brought glass. They we're rapidly confiscated. Still had other booze but cider is hard to find in USA. Being the handy one I set up the tent pretty quickly considering I'm melting and bordering heat stroke. Not quite an 8man tent... not even a respectable 4man. Expecting 2 bed areas and a large communal area. This tent had no divide to seperate the rooms. Being a group containing 2x 20 years olds and 2x 50year olds this wasn't ideal but Coachella. We managed to get the airbeds up with our 12v pump and just about fit them in the tent. Hiss. I guess this is what buying camping gear from Walmart does to you... 2 didnt even stay up due to a lovely gash on the top with no means of repair we went to the on-site shop for some gaffa tape which didnt work. With airbeds priced at $50 new ones were off the cards... given the next pressing matter. so we shelled out $100 for shading. 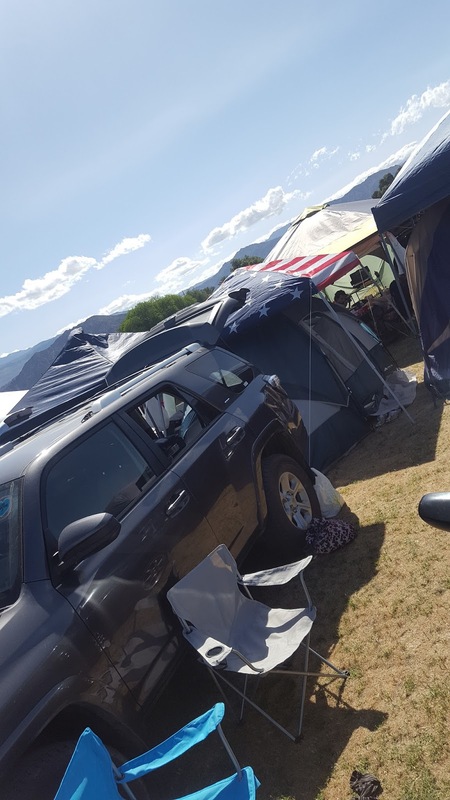 Needless to say this set back wasn't ideal and squeezing into a poor tent on the floor in the heat was back off the cards... welcome to car sleeping 101. 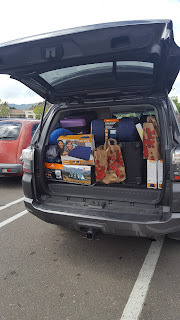 Sleeping in the boot of a Toyota 4Runner is borderline better than the tent though. 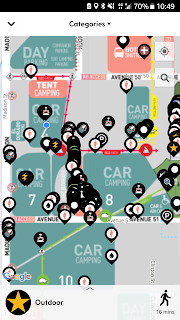 Back in 2012 buses where nearby to take you off-site for booze, food and anything else from local areas. Being able to buy tickets at the stop. We got 2 shuttle pass tickets with our weekend passes so had banked on travelling out for food Mistake number I've lost count. The shuttle stop was a very long walk away 25mins to get to, but we persevered to go for dinner. Given the food onsite was expensive, easily $12 for a slice of pizza so you need around $50 for food a day. Turns out you can't buy bus tickets now, you can't even get a bus anywhere but the hotels. There are ubers and taxi ranks... another 15mins walk on to those. Beefed up security RFID Wristbands are used for more than checking into facebook, everywhere in the site is controlled by them and if you leave the site and 'dont scan back in' even if you did, you will struggle to get into the Main Arena. These wristbands can be a pain, there are a lot of people whos wristands needed resetting, repairing or reactivation... 15mins queue at the gates. 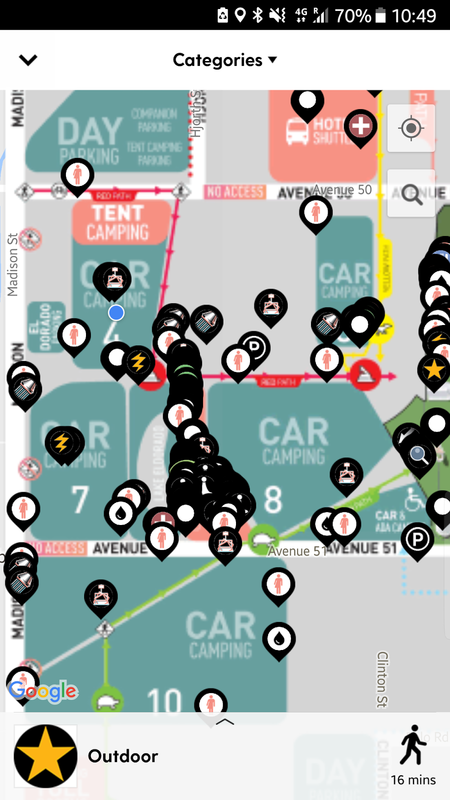 So if you're on the last minute to get to the stage be prepared. 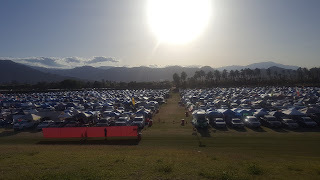 I think that covered my mistakes and negatives of Coachella Car Camping 2017. Though don't let that put you off! Prepare, Plan, Party.